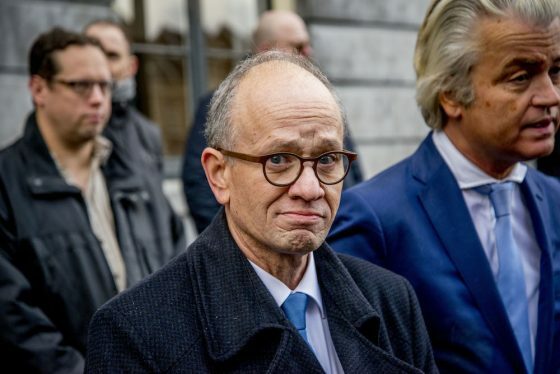 The anti-Islam PVV has run into more trouble with its local election plans – this time after its campaign leader in Utrecht said he would rather the city’s mosques burned down. Henk van Deun, who worked for the police for nine years, has come under fire after a local radio interview with other candidates. When one suggested he would like people to be as proud of the city’s ULU mosque as they are of the Dom tower, Van Deun said: ‘We would rather it burned down, so to speak’. The PVV will take part in 30 council votes on March 21, after failing to find enough suitable candidates to contest the 60 local areas party leader Geert Wilders had hoped for. Last month, the PVV dropped its Rotterdam campaign leader after one day because of his far right links. Géza Hegedüs, described as a former soldier with a Hungarian background, was unveiled by far-right watchdog Kafka as having ‘extreme right-wing ideas’ and close connections to Dutch extremist group Erkenbrand. In 2016, five men from Enschede were jailed for three and two years for attempting to set fire to a mosque in the city, in what judges said was a ‘terrorist act’. The men were convicted of throwing two Molotov cocktails at the mosque in February 2016. Some 30 people, including children, were inside the mosque at the time.